As an accomplished high school coach, Aado Kommendant is used to feeling a certain amount of pressure when it comes to teaching his craft, as well as directing life's lessons to young athletes on how to handle adversity. 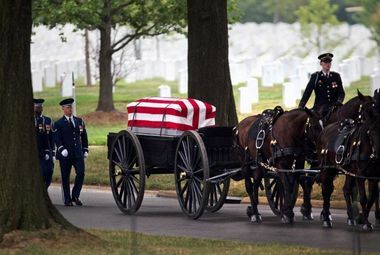 Courtesy of Aado KommendantThe flag-draped casket of United States Air Force Major Aado Kommendant is escorted on a horse-drawn caisson at Arlington Cemetery. So when Kommendant, the 45-year-old softball coach at Raritan High School, was forced to deal with a different kind of pressure in an extremely personal and emotional way this past week, the coach tried to draw within his inner professional strengths. It didn't quite work. But in this instance, why should it? Kommendant was at historic Arlington National Cemetery on Aug. 8 to say hello, as well as farewell to his namesake, a man he never met, but felt like he knew intimately. Major Aado Kommendant, Aado's uncle, was a pilot in the United States Air Force when he flew what would be his last mission on Aug. 8, 1966. Kommedant's plane, which he was co-piloting with Lt. Col Charles Walling, was shot down over Song Be Province, some 40 miles northeast of Saigon, during the Vietnam Conflict. The bodies of the two men were not recovered at the time of the crash, and it took 44 years and two excavation teams, along with modern technology and DNA results before the remains of the two pilots could be positively identified. Courtesy of Aado KommendantIvo Kommendant, brother of the late Major Aado Kommendant, is escorted to his brother's final resting place at Arlington National Cemetery by his son, and Major Kommendant's nephew, Raritan softball coach Aado Kommendant. Forty six years to the day of the crash which claimed his life, Major Kommendant was laid to rest at Arlington. 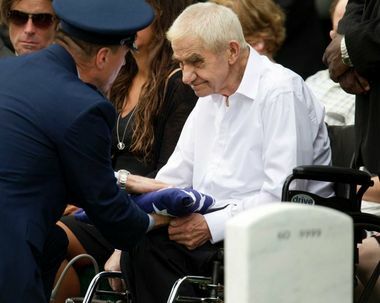 He was given a hero's funeral which included a horse-drawn caisson, the presence of an Air Force band, the presentation to the family of theÂ American flag,Â which draped his coffin, a 21-gun salute, and the ultimate send off of taps at the conclusion of the 20-minute service. For Aado, who was born nine months after his uncle's plane went down, he didn't quite know what to expect upon arriving at Arlington, but knew pretty quickly the occasion would be overwhelming. "I knew I was in trouble when, at the arch by the entrance of Arlington, I first saw the hearse and the flag-draped coffin inside and said to myself, 'that's him'," Kommendant said. "Until today, my only reflections of my uncle was pictures, but nothing tangible. Now, for the first time, he was there, in front of our family. Just seeing that coffin and knowing a part of him was in there was something very difficult to describe." Major Kommendant was a 1960 graduate of Lakewood High School, where he was voted 'best looking' by his classmates. He would go on to attend the University of Miami, where he served in the ROTC program there, eventually earning a commission as an officer in the Air Force. 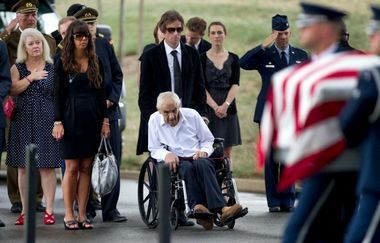 Courtesy of Aado KommendantIvo Kommendant is presented the American flag which draped his brother's casket at Arlington National Cemetery. "When he was killed, I believe he was a First Lieutenant," Kommendant recalled. "He was promoted posthumously, twice." Major Kommendant had flown 17 missions during a two-month stint in Vietnam. He had been scheduled for a year's active duty there. Following the crash in 1966, Kommendant was first listed as Missing in Action. Thirteen years later, that status changed to Killed in Action, although his body was never recovered. It took another 13 years before a joint team from the United States and Vietnam investigated the crash site. By 1994, a team of Americans and Vietnamese evacuated the site and recovered Walling's dog tags and other military equipment, according to a press release issued by the United States Department of Defense. Sixteen years later, the site was excavated again, and more evidence was recovered, including human remains. Major Kommendant's brother and Aado's dad, Ivo, provided DNA and in 2010, Major Kommedant's remains were confirmed. 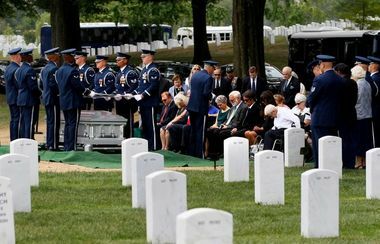 At Arlington, one day shy of what would have been Kommendant's 71st birthday, the Kommendant family was represented by Ivo, 77, as well as Aado's sister, Karen, and the nephew who had never met his uncle. (Aado's mother, Mare, is deceased). "The entire ceremony was handled with so much dignity," Aado said. "When we got to Arlington, as I said, the hearse was already there. At first, I didn't know that was his coffin, but then it occurred to me. From there, the coffin was removed and placed on a horse-drawn caisson. It reminded me of John F. Kennedy's funeral, and growing up, I was really into that era, so it hit home. We followed the caisson for about maybe a tenth of a mile to Section 60, where the service was held. Courtesy of Aado KommendantA United States Air Force Honor Guard proceeds to wrap the American flag after removing it from the casket of Major Aado Kommendant. Section 60 is also the final resting place for 13 of the United States NavalÂ Seal Team Six members who died on Aug. 6, 2011 in a Chinook helicopter crash in Afghanistan. "We were all taken aback with the entire ceremony in that it was more beautiful than we could ever imagine," Aado said. "I never expected to be that moved. I'm just glad I had dark sun glasses on. The playing of taps at the end of the ceremony was tremendous. And to share the moment with Col. Walling's family, made it even more special. His sons were there and they are wonderful men." Closure can be defined as a feeling of finality or resolution, especially after a traumatic experience. For the Kommendant family, theÂ opportunity to say hello, and ultimately, farewell, to not only a brother and uncle, but an American hero, on the same day, provided a level of closure which should exude relief, as well as deep reflection.